House of Woyaks: Stomp Out Stains! 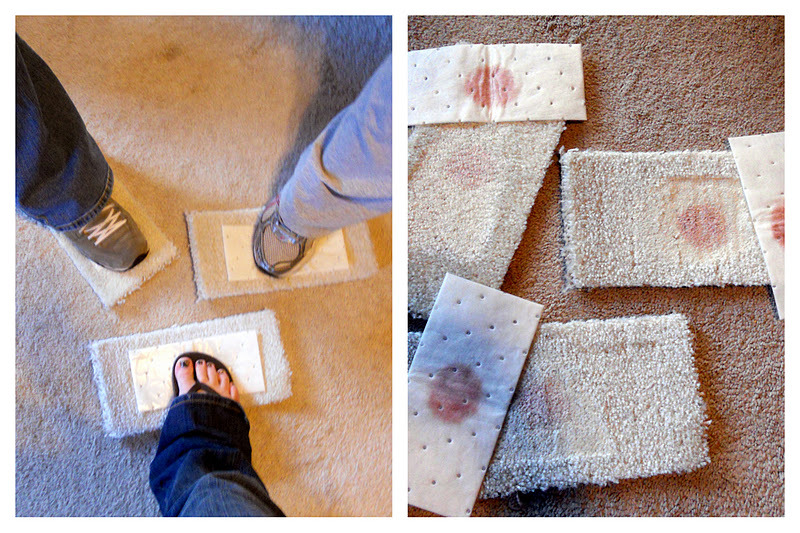 Welcome to "Stomp Out Stain Week" brought to you by BISSELL! When you were little (or if you are like me...maybe you still do this), did you stomp your foot when you got mad about something? I always do that. Hands on my hips and everything. Now I have a much better reason to do it. If the kids spill something, I can "stomp and go" with the help of BISSELL. Right: 30 minutes later we took a look. Rachel's stain seem to life better. But, Caroline's stain must have been pretty strong. 1. Rachel could see that the cleaner in the product seeped to the underside of the carpet sample. This makes us wonder, down the road if the stain will come back to haunt us. 2. The stain did not completely come out on out samples. A few thoughts on this: Maybe this was a deep stain and we needed to leave it sitting for 24 hours instead of the 30 minutes. Or, maybe we didn't stomp hard enough. The BISSELL Stomp N Go can currently be purchased online thought BISSELL's website or at WalMart for about $5. FACEBOOK GIVEAWAY GOING ON NOW FOR BISSELL STOMP N GO!